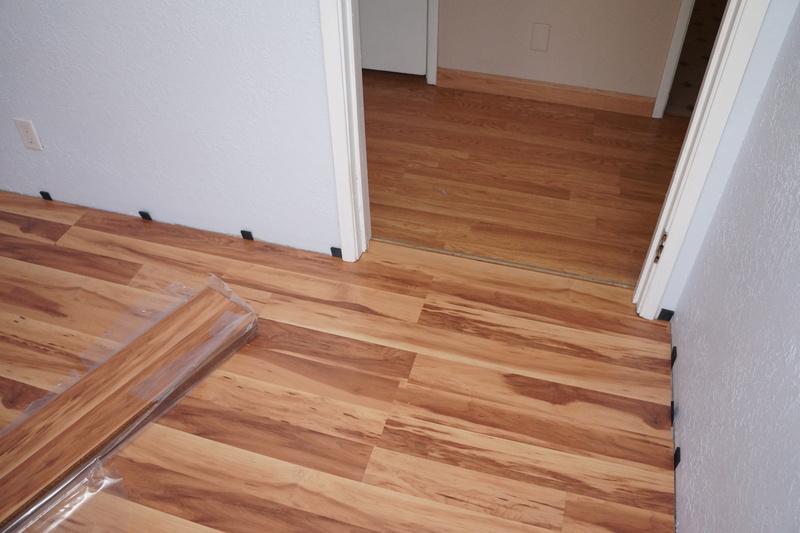 Laminate is cheaper than hardwood and easier to install. It is easily and completely washable, scuff resistant, tough, durable and attractive. Though it does not look exactly like the hardwood it mimics, it looks good enough for me to live with. 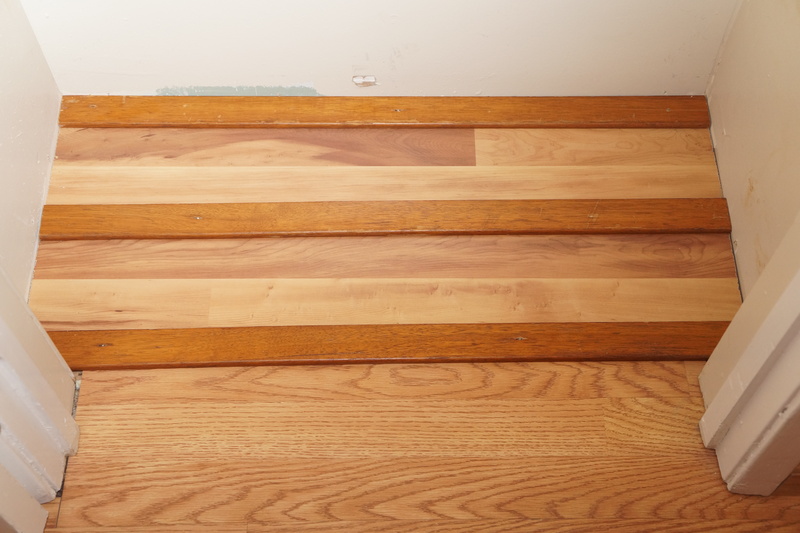 While not as cheap as carpet, vinyl, or linoleum, laminate is cheaper than hardwood or tile floors. 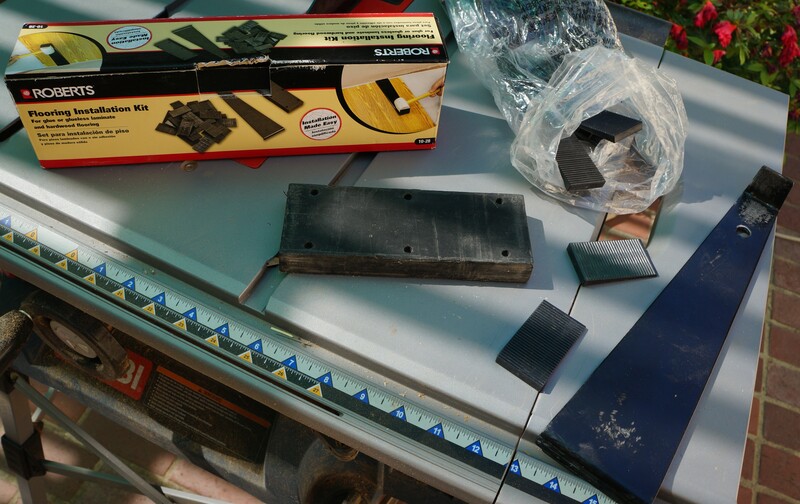 Here’s the tool kit you’ll need; plastic tapping block, a pulling bar, and small wedge spacers for wall offset. You’ll also need a hammer, square, pencil, trim nails and a saw. I bought this Ryobi table saw in the same big-box hardware store where I bought the flooring. It cost $200USD and I think a chop-saw at half the price would have worked as well. Since all cuts are covered by the baseboard trim, I probably could have used my Skilsaw. But I’ll use the table saw in the future and the cost was not bad. The big-box store ‘associates’ were very good at figuring the number of bundles and trim to buy and I ended up with only enough off-cuts to floor the foyer closet and the linen closet. They figured the trim board length correctly too. Start the first course by cutting off the tongue of the boards for the first row only. Place boards left to right using the spacers to keep the boards the required distance from the wall (1–10 millimetres (0.039–0.394 in)). Use hammer and tapping block to ‘click’ each succeeding board to the one to the left. Measure and cut the last board to fit. Hook flanged tool to last board near wall and hammer the bar to snap in the last board. To start the second row, cut a board in half or thirds depending on how random you want the ‘joints’ to appear. Tilt your side of the board and insert tongue in groove. Gently hammer, using block, and it will drop flat. Then hammer more vigorously to snap it into place. Next tap the right end of the board right-to-left to snap it into the previous board. Never tap with bare hammer as only the surface of the board is durable, the rest is like cardboard and easily damaged. Use the block. For the third row you can probably use a full board to start and cut the final board as with the first row. Continue row by row, making sure the fake joints and the real one don’t line up too much. Hammer the tapping bar to close all gaps and snap the board in. When you get too close to the wall to hammer, slip in the flanged pulling bar and tap firmly to lock. Don’t slam so hard you wreak the board but firmly enough so no gap shows. Some boards will be faulty and some will break. Don’t worry, the big box store figured it into the estimate so you’ll have enough tiles. When you get to molding, closets, etc., measure and cut to fit. Remember the floor is supposed to ‘float’ on top of the sub-floor so leave a gap but make sure the gap is small enough for the trim to cover later. Cut the last row of boards to width to fit and still leave a gap. Use the flanged tool to snap it to the penultimate row. Remove the wedges and install trim of your choice. They sell matching laminate trim but I used plain white ‘1×4’ trim to lighten the place up a bit. This pic shows the house’s linen closet floored with leftover cut boards from the bedroom. I disguised the joints with battens. Though it is tough, it’s important to keep high-traffic areas swept to prevent scratching and be sure to mop up spills quickly to prevent soaking through. I’ve used water, Windex and vinegar to mop the floor and they all work well. I don’t soak the floors but do get them wet and have not noticed any swelling, though like any factory product not all the tiles are perfect and over time I noticed in most rooms small glitches had appeared in the form of nicks or tears, thankfully mostly on the sides and covered by furniture, YMMV. Unless noted, text and images by and copyrighted by todgermanica.com and are free for non-commercial use with attribution. I’m not paid by WordPress for any ads here.